Matthew Terry was born in Somerset, New Jersey, U.S., in 1992, is an American male model. He was discovered at the age of 20, after his mother submitted his photos to a VMAN/Ford Model search. 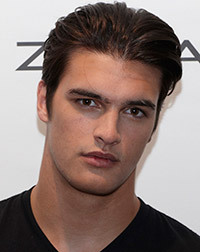 Long time highly ranked on The Money Guys and Top 50 male models List, by models.com. Featured in Calvin Klein TV ad during the 2013 Superbowl. Matthew's hobbies are to playing the drums and surfing. He also working as a personal trainer. GQ Spain Cover, At Large Magazine Cover, GQ Style Taiwan, L'Officiel Hommes Singapore Cover, Harper's Bazaar Thailand Men Cover, Dansk, V Magazine Covers, V Man, Esquire Mexico, Harper's Bazaar UK, Harper's Bazaar U.S., Vogue Hommes Japan, Dazed & Confused, Details Magazine, L'Officiel Thailand, Essential Homme, Out Magazine, Interview, Hercules, Man About Town, PEPLVM Cover,. Trussardi, Calvin Klein, Massimo Dutti, MAC Summer, Philipp Plein. Walked runway for Fashion Rocks Show, Versace, Joseph Abboud and DKNY. Represented by agencies Ford Models New York and Barcelona Sight Management Studio. For the campaign, I really focused on my diet and exercising. I was more determined to be a personal trainer and a musician. I try to go to the gym at least five times a week. Make it a part of my daily routine, like getting up and showering... but you have to finish your workout with a good meal. I’m still very new to the modeling world so unfortunately I don’t know that many designers yet. I always try to do some type of physical activity during the day or at least just a quick workout if I’m at home. I don’t think I have a secret talent, but I really like to play music. I like to play the drums.